Is Global Warming Human-Caused? The views of U.S. Senators vs. their constituents. In January 2015, the U.S. Senate voted on an amendment sponsored by Senator Brian Schatz (D-HI) stating that: “it is the sense of Congress that — (1) climate change is real; and (2) human activity significantly contributes to climate change.” 50 Senators voted in favor of the amendment, while 49 opposed it. Believe that global warming is either not happening or caused mostly by natural changes. We compare each Senator’s vote on the Schatz amendment with the views of their own constituents, as depicted in the chart below. Please click here to access the full interactive chart. Each Senator’s vote is tallied in either the “Yea Votes” or “Nay Votes” column, where a “Yea” means the Senator voted that climate change is significantly human-caused. 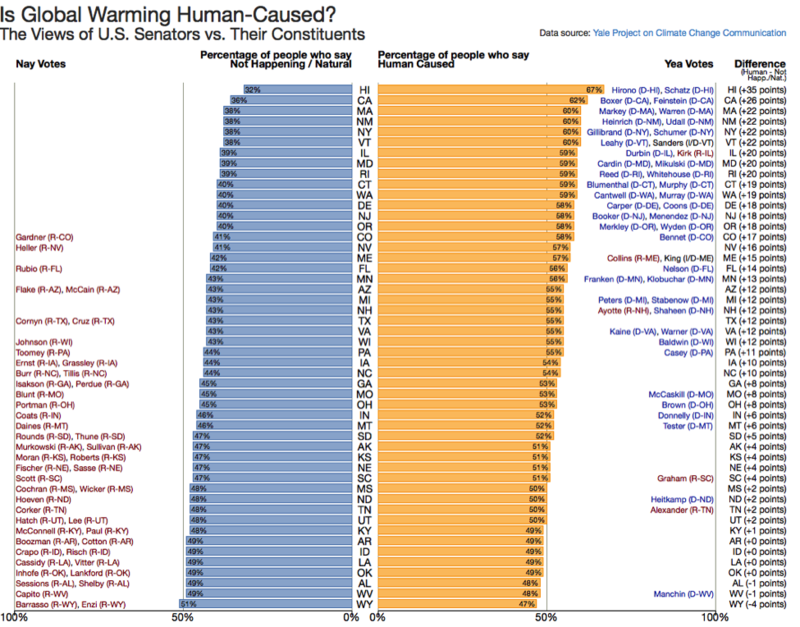 The orange bars depict the percent of the public who believe climate change is at least partly human caused, while the blue bars depict the percent of the public who believe climate change is not happening or naturally caused. The far right column subtracts the people who say it is not happening or naturally caused from those who say it is human-caused, summarizing the predominant view of the public within each state. In 43 of the 50 states, more people say global warming is human-caused than not, while in only three states do more people say global warming is not happening or naturally caused, than human-caused (four states were split evenly). At one end of the spectrum is Hawaii (Senator Schatz’s home state), where more than twice as many people think global warming is human caused (67%) than think it is not (32%) – a difference of 35 percentage points. At the other end of the spectrum, slightly more people in Wyoming think global warming is not happening or natural (51%) than think it is caused by human activities (47%) – a difference of 4 percentage points. Several Senators took positions different than their constituents. For example, Senator Cory Gardner (R-CO) voted against the Schatz amendment, yet Coloradans are 17 percentage points more likely to believe climate change is human caused than not. Likewise, Senator Dean Heller (R-NV) (a difference of 16 points) and Senator Marco Rubio (R-FL) (a difference of 14 points) each voted against the amendment, expressing a view at odds with a majority of their constituents. However, several Senators voted for the amendment although public opinion in their state is more evenly split. For example, Senator Joe Manchin (D-WV) and Senator Heidi Heitkamp (D-ND), voted for the amendment, yet West Virginians and North Dakotans are essentially evenly divided on whether global warming is human caused or not. Two of the five Republicans who voted for the Schatz amendment, Senator Lamar Alexander (R-TN) and Senator Lindsey Graham (R-SC), represent states where the difference between the two viewpoints is also relatively small (+2 and +4 percentage points, respectively). Independent survey validation tests found that the estimates are accurate within +/- 3 percentage points at the state level. For more details on the methodology behind the model results, please refer to the peer-reviewed paper. This research was funded by the Skoll Global Threats Fund, the Energy Foundation, the 11th Hour Project, the Grantham Foundation for the Protection of the Environment, and the V.K. Rasmussen Foundation.